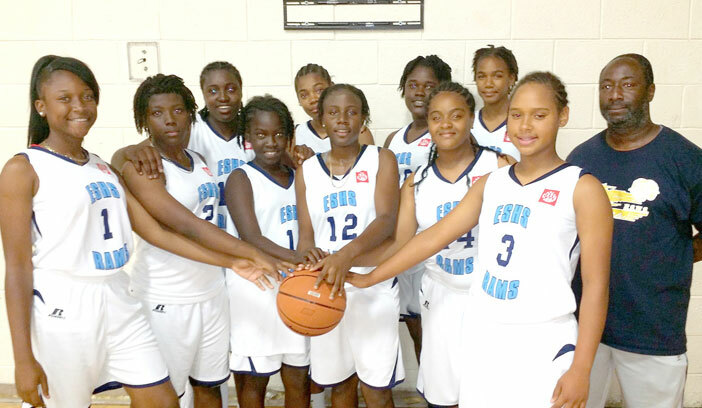 Elmore Stoutt High School Lady Rams, won the Bertha C. Boschulte International Junior Varsity March Madness Basketball Tournament in St. Thomas on Sunday. 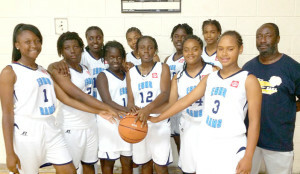 35-30, to win the BCB International Junior Varsity March Madness Basketball Tournament in St. Thomas on Sunday. Fahie finished with 19 points to lead the Rams. Jah’Lysha Samuel and Nailea Nicholas combined for 24 points to pace the Lady Blazers. Scatliffe said many of the girls were worried about the money they had to put in to make the trips to St. Thomas for Interscholastic Athletics Assiociation (IAA) league play. He had two girls who competed in league games last week, who didn’t make the tournament because of funding and he picked up a different two who were able to help the team. The Lady Rams opened with a 29-17 victory over Charlotte Amalie High School. They then upset previously unbeaten Adeleta Cancryn—handing them their first loss of the season—25-18, before falling to BCB, 28-17. A 26-19 triumph over Charlotte Amalie placed them in the final. The Boys team lost to Charlotte Amalie, 42-38 in the final. Michael Richardson led the Rams with 16 points. The Rams began their trek to the final with a 39-35 triumph over host BCB, before crushing Montessori, 39-2, then they beat back Eudora Kean, 42-33 to advance to the final.